Ever wondered how many scales there are? Do you struggle to know which are the best to learn or forget? Stuck for soloing ideas? 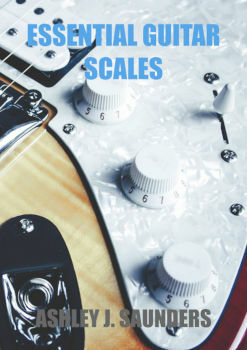 Well, then the Essential Guitar Scales eBook will show you the 14 most useful scales every guitarist should know and use. While there are thousands and thousands of musical scales and you can purchase an encyclopedia of 200 scales, you only really to know the 14 contained in this eBook. This allows you to quickly learn and apply any of the scales in the eBook to your guitar playing. And once you've learned a scale in one key, moving it is simple. The hard part is the learning in the first place! By learning scales, you will explore the guitar's entire fretboard and learn where every note is. Scales are also the foundation of soloing and therefore you should at best know Major, Pentatonic Minor and Chromatic scales. Expanding on these three will give you more options and ideas when soloing. 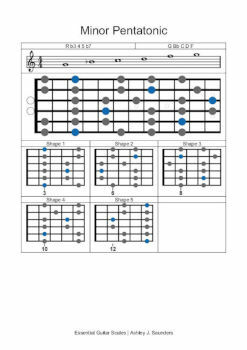 So if you want to develop your soloing and musical understanding then Essential Guitar Scales eBook will enable you to grow. This eBook is aimed at those want to learn what scales are useful for guitarist and which aren't.